Kelly Marie broke The Bee Gees’ stranglehold on the top 2 spots this week as her ‘Make Love To Me’ moved into second place, knocking The Bee Gees’ ‘How Deep Is Your Love’ into 3rd place. 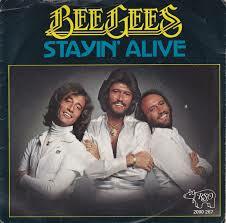 ‘Stayin’ Alive’ remained at 1 and was enjoying its 4th week there. For the past 3 weeks ‘Stayin’ Alive’ and ‘How Deep Is Your Love’ had been at 1 and 2 respectively. The Bee Gees had now clocked up a total of 18 weeks at the top of the charts overall and this put them tied 2nd for weeks at 1, joining Abba and Tom Jones and sitting 1 behind the leaders, The Sweet who were on 19. Despite no longer having the top 2 hits, The Bee Gees were dominating the top 5 as their ‘Night Fever’ moved up 4 from 9 to 5 to give them 3 of the top 5. This was the first time any act had managed to have 3 of the top 5 hits. Climbing honours went to Smokie’s ‘For a Few Dollars More’ which moved up 6 from 19 to 13 to give them their 3 biggest climber award. They were joined in a having a star rater climb by The Bee Gees’ ‘Night Fever’ (mentioned above) and Supercharge’s ‘I Think I’m Gonna (Fall In Love)’ which climbed 4 from 14 to 10. It was The Bee Gees’ 24th star rater and they were now in the outright lead for having these, moving 1 ahead of Tom Jones. It took just a 3 place drop to scoop yourself a faller of the week award and we saw 6 songs do this. They were Uriah Heep’s ‘Free Me’ (down to 20), Judy Cheeks’ ‘Mellow Lovin’ (down to 16), Clout’s ‘Substitute’ (down to 15), Debby Boone’s ‘You Light Up My Life’ (down to 14), Neil Diamond’s ‘Desirée’ (down to 9) and Wings’ ‘Mull Of Kintyre’ (down to 8). It was Neil Diamond’s 9th time with the award and he was the 10th act to reach this total. 6 was the record to date for number of fallers in a week and this was the 5th time we had seen this with 3 of the 5 being 3 place drops, and 1 each being 1 and 2 place drops. Clout’s ‘Substitute’ and Wings’ ‘Mull Of Kintyre’ became the 43rd and 44th songs to reach 20 weeks in the charts. They had now been the oldest in the chart for 8 weeks now. Only 14 songs so far had managed to be the oldest for 8 or more weeks. There were 2 songs that left the charts this week, the first of which was Bonnie Tyler’s ‘It’s A Heartache’. It had been with us for 18 weeks and was the best performer to date of her 3 hits in terms of weeks, but was tied top for peak position, equalling that of ‘Lost In France’. She had a couple more hits to come. We also bid farewell to McCully Workshop’s ‘Chinese Junkman’ which lasted 8 weeks in the top 20 and peaked at 9. This brought to an end their SA chart career with 3 hits to their name, 28 weeks and a best peak of 1 which ‘The Buccaneer’ managed, spending 2 weeks there. Tully McCully’s name would be seen as song writer and/or producer on a number of further hits. Uriah Heep returned to the charts with their second offering, ‘Lady In Black’. With ‘Free Me’ still being in the charts, they joined 57 other acts in having had at least 2 songs in the charts at the same time. As with ‘Free Me’, ‘Lady In Black’ did not make the UK or US charts, but it did manage to get to number 5 on the German charts (contrary to the chart topping success attributed to it on Wikipedia). It also managed a number 6 placing on the Swiss charts. ‘Lady In Black’ joined The Hollies ‘Long Cool Woman In A Black Dress’ and Mungo Jerry’s ‘Long Legged Woman Dressed In Black’ in the list of songs about females in dark clothing. The other new entry was also by an artist enjoying their second SA chart hit. ‘I’m Getting Good At Missing You’ by Don Williams followed up his number 5 success in 1977 with ‘I Recall A Gypsy Woman’. The song was written by Wayland Holyfield who has had writing credits on songs recorded by a long list of Country music luminaries, but this was his first to chart in SA. Despite Williams managing 58 hits on the US Country Singles charts to date, this was not one of them. With Clout’s ‘Substitute’ reaching the 20 weeks in total, the band also hit that milestone and were the 57th local act to manage this. Neil Diamond reached the 110 week mark and made 10th place on the overall weeks count list his own, moving 1 ahead of The Rolling Stones who dropped to 11th. The Bee Gees moved into second place overall for points with their 1,981 helping them to leapfrog Abba who were on 1,958. They were just 189 behind the leader, Tom Jones, and with 3 in the top 5, were clocking up over 50 points in a week. Silly stat of the week: This was the 15th time the double vowel sound ‘ee’ featured 8 or more times in the chart where both the song title and artist names were counted. We had 3 Bee Gees, 2 Uriah Heeps, Judy Cheeks, ‘How Deep Is Your Love’ and ‘Free Me’. The record to date was 10 in a chart which we had seen 5 times. We had seen 9 on 5 occasions and 8 on 5 occasions. There had only been 14 weeks out of the 676 so far where the ‘ee’ had not appeared in the song titles or artists names. This entry was posted in 1978 and tagged Bee Gees, SA Top 20, South Africa, Springbok Radio, Staying Alive. Bookmark the permalink.